Master Sai Saketh Cherukuri is a former student of Sri Sathya Sai Primary School, Puttaparthi (3rd through 5th). Currently he is a sixth grader at Roberto Clemente Middle School, Germantown, MD 20874, USA, and a group two Bal Vikas student who visits the South Bethesda Sai Centre regularly. The modern world feels that science and spirituality are totally different aspects. Science is only a fraction of spirituality. Spirituality begins where science ends. Not many of us understand the link between science and spirituality. This is my humble attempt to link the two. Science is backed by lot of data and evidence, but spirituality is based on personal experience. I would want to highlight the connection between science and spirituality through the 'Magnet'. I always get attracted to magnets and love to play with them day and night. In this process, megnet has also taught me many important lessons. Magnets were discovered around 800 BC, purely by chance. Magnes, a shepherd grazing his sheep on the greens of Mt. Ida experienced a mysterious force that stuck the nails present in his shoes to certain rocks. Large deposits of these rocks were found in Magnesia in Asia Minor. That was how the name Magnet originated. These rocks contained a naturally occurring mineral which had the property of attracting iron pieces. This mineral was called ‘magnetite’. These rocks were also called lodestone (which means 'leading stone'). Induction is a phenomenon wherein a permanent magnet when brought close to a metallic object, passes its energy to the object. Thus, the object then behaves like temporary magnet. If the object stays close to the permanent magnet, it becomes almost a magnet. Likewise, if we are in close contact with and practice Swami’s teachings constantly we too will become divine like Swami. 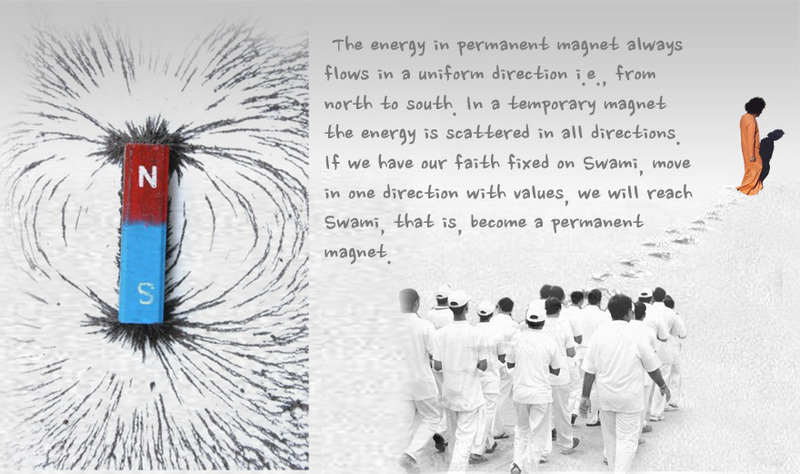 On the other hand, if we stay away from Swami’s teachings, we will be demagnetized. 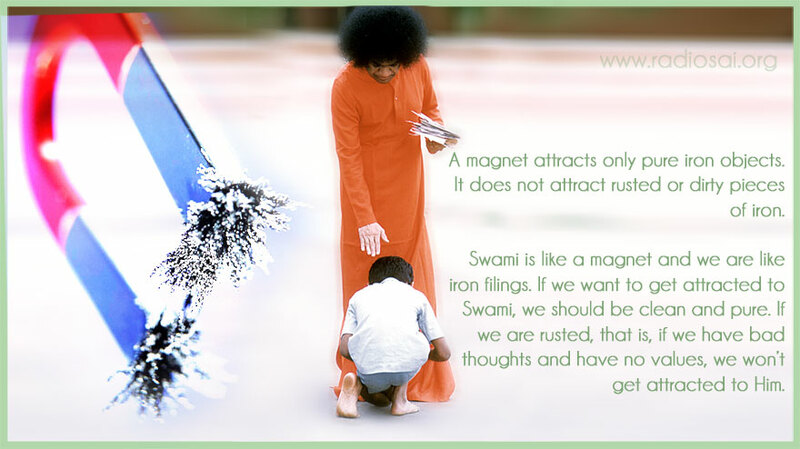 So we must always keep Swami’s Name in our mind, follow Swami’s teachings and go to Sai Centres regularly and attend bhajans to keep ourselves magnetized and being magnet-like Swami. Another important lesson on the same lines: Swami always says ABC of life is Avoid Bad Company. It is very important to notice the kind of friends we maintain. Our thoughts depend on the kind of friends we have. So, if we have good friends, we have good thoughts. The energy in permanent magnet always flows in a uniform direction i.e., from north to south. In a temporary magnet the energy is scattered in all directions. If we have our faith fixed on Swami, move in one direction with values, we will reach Swami, that is, become a permanent magnet. It is the nature of magnets to be strong and retain its properties regardless of the circumstances. For instance, if a magnet breaks into two, then the broken parts will still have a North and South Pole intact. Similarly, we must always keep our values and principles intact no matter what the situation is. That is what I learnt from magnets which I like very much. 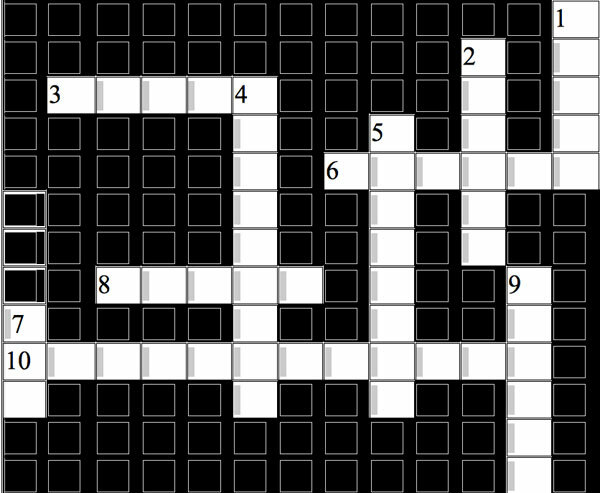 Now, here is a crossword puzzle I have made on what you read till now. What happens when a magnet is heated or hammered?